my name is Jac van de Walle, I was born in Holland, and I have been an electronics enthusiast ever since I remember. My first real project was a Crystal Receiver, when my father bought a experimenter kit for me as a kid. We lived close to the sea, and there were many ships you could receive. Some signals were so strong, you would hear all kind of voices and noises, just by putting this is series: 10 meters if wire, an OA79 diode, a crystal ear plug, and the water pipe of the house, which acted as ground. I was only six years old, and I was afraid the ships would have problems when I did not switch the receiver off after use. So my knowledge of electronics was a bit limited. Understanding the tuning circuit came later, so when that part didn't work (which was often so) I teared it down and start from the beginning again, 5 or 10 times, until it worked by coincidence. later I added an OC13 transistor, working on only one 1.5 Battery, to amplify the audio signal. These OC13 cost 2.75 Guilders, I remember the price exactly. That would be like 20 Euro in today's money, and they last very short when you are a kid. So, an OC13 was my standard birthday wish. I once had an OC13 with a broken off lead wire. I managed to open up the glass case, and re-solder a very thin copper lead to the chip. For this, I wound a single filament from a stranded mains cable, around the tip of the solder iron. Then by cutting this wire to the right length, I could find a position which just hot enough to melt that little drop, and not damage the chip. It worked, and it was not even hard to do. Though the gain was not so good as it was before. (Later I learned these chips were soldered indeed, with so called Bismuth solder, which solders extremely good, and at temperature much below normal solder). OC13 (the unlucky number) were rejected OC71. Philips did that very clever, they set up this OC13 part number with lowered specifications, and many rejected transistors (with too much leakage or too low break down voltage) would pass the OC13 specifications still. In my brith town VLAARDINGEN, I was lucky to have two very good electronics shops, 'Dirk van de Bend' and 'Quakkelstijn'. At the house of Quakkelstijn you can still see his name on the above photo, his son carried on the shop until 2010 or so, but now both shops are gone. When I was 12 years old, color TV was coming suddenly. 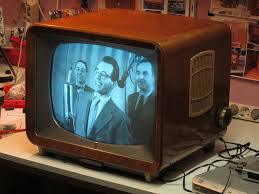 Each family would watch TV together from 19h to 23h in the evening, so having a TV was essential. A new color TV would cost appr 1/5 of the price of a new car. So many people would use up their old Black and white TV until it needed a repair, and then dispose of it. I got hold of many of those for free. The older Philips types without printed circuit boards were very good quality, with a special made 800 Ohms loudspeaker which worked without SE transformer directly on a PCL82 tube. These had a relatively long picture tube, so they could do with not so high acceleration voltage. It was only 16kV. These TVs suffered from cigarette smoking, as most living rooms had always smoky air. It was completely normal in those days. These TV chassis developed a lot of heat, and air circulation was very high inside. The smoke would build a brownish layer, combined with household dust. That layer was typical in all old TVs, it was a bit sticky, and would attract humidity. The old timers amongst us will remember this. If I see a picture of such a TV, I have that smell in my memory still. The Philips picture tubes, when good, had a very sharp picture, and very bright too. A lot of sharpness disappeared at the introduction of color TV, as the video (luminance) signal gets smeared by the color (chrominance) signal. Some of those black and white TVs were so good, they would even show the color information, but of course only as signal noise. So that's how the sharpness got lost, due to a bad compromise with standardization, and it stayed like that for ever after. Looking back, these Philips TV's were milestones of miniaturization and quality. I found these broken TVs were very easy to get for free. I picked the Philips, and without understanding much about the details, I could repair 50% of them, and the rest served as free parts supply. A good one would sell for 65 Guilders, which was really nice money in those days. I spend it on books about electronics, and electronics parts. When I was 15 or so, my TV repair business dried up. Suddenly nobody wanted to have a B&W TV any more. I finished my graduation in electronics in 1984, and started my first job in R&D at the company 'van Berkel's Patent', now called DEKO. I was working on Analog to Digital converters and switched mode power supplies. My strength was to bring products with reliability problems in good order again. I was able to give new life to a product called 834EP, an automatic slicer machine, controlled by microprocessor. In fact it was given up, because the motor control would blow up, and the A/D converter was instable and all kind of unexplainable defects of the power electronics. They let the 'new guy' give it a last try. It was given full power to do as like, because frankly it was given up anyway. I found it was caused by bad PCB design. They just designed it by computer, mixing microprocessors with HV switching electronics and a primitive A/D converter, and weighing scale electronics. There was no awareness you can't just have a computer PCB design program knock that together. It took me half a year to improve the PCBs, and pay more attention to the high frequency aspects of this. But then came the message from the Rotterdam production site: 'All 834EP are working good, right after assembly'. They never had that situation before. After that I was quickly given more projects, but I had my mind already on leaving the company. They ramped up production of the 834EP instead of phasing it out, and I was very surprized to see it is in production still, more than 30 years later. In 1986, I moved from Holland to Germany, because of a very nice job offer by Hewlett Packard. At first as an Application Engineer, and later as a field sales engineer. In those days it was a privilege to work for Hewlett Packard. At least everybody felt so, myself included. The company had an artificial subculture, like a society. It was still original when I joined, and the founders Dave Packard and Bill Hewlett were still on duty. You would be terribly mistaken, when you think they build this company out of nothing, just by coincidence. These two founders always made rules for overall processes. With this I mean processes, which involve the whole company as such. For them, the factor 'people' was a very important one, if not the most important. In their own way, they were keeping the company on the main course, and I am sure they had put into some simple rules as well. Though such rules were of course not always openly published. JAC-Music was founded in 1993, originally as a hobby, building 845 based SE amplifiers. Tax wise only making loss. In 1994 I got in contact with the AVVT Electron Tubes company by coincidence, and I kept in touch. In 1998 I proposed to do their worldwide distribution, and they agreed. At that time the profit was very small, and there were only three tubes in the program: 300B, 32B an 52B. For me this was just for the interest I had in it. I convinced Alesa Vaic to expand his product range, and we went through a very innovative period. We were the first to re-issue a single plate 2A3 tube, and mesh tubes, and other nice tubes like the AD1, PX4, PX25, and the 274A. Today, you can buy a new made single plate 2A3 from several factories, but we were actually the FIRST to re-issue it. That was in the first days of the internet, and we were so happy we could gather inputs from people on the rec.audio.tubes Usenet forum, which was free at that time, and 'the' medium to publish your information. It may seem hard to believe, but having a website came later. We didn't know exactly how to build a 2A3, so we started with a modified 300B but we couldn't get the characteristics like a real 2A3. Later we changed the construction to get a true 2A3. This was the first single plate 2A3 build ever since the big companies stopped with it, in the 1950's. No tube company had that tube available. Think of this while you can buy a 2A3 now from China, and Russia, and from Yugoslavia, that the first re-issue 2A3 I had on my desk made by AVVT. It looks terrible, but it works good. This tube is some piece of HiFi history! Quickly after that, we made a mesh version, with real 2A3 characteristics, and it was the first re-issued MESH 2A3 tube, that we made that way. I still have this tube, it looks very nice, and it works perfect. It's a milestone of today's Retro-Tube-Technology. This was the first mesh tube ever re-build again, and we never changed anything fundamental to the design of that tube. The initial ideas for a mesh tube came from some of our friends from the New York tube scene. (thanks Dave Slagle!) Today, there are many factories building 2A3. They are all followers of our ideas. Most of the marketing work was done by me, and the technical work was by Alesa Vaic. A break through we had, when I bought for Alesa a tube tester, of which I knew it was a bit off calibration, the reading was a tiny bit too low. They had to pass any tube by this tester, because I had exactly the same one here, but with normal calibration. Later he understood, his tester was a bit 'weak', but like that we would never have a discussion about a tube that was only 'just good' on his tester, as it would be 'fine' on my (good) tester. He accepted that. As quality improved, business was picking up, though lifetime of the products to my opinion could have been a lot more better. Then things went faster, sales started to rise suddenly. It was good business now. Then In 2002, unexpectedly I received a three lines email from Alesa's wife, telling they decided to do all sales them self. At the factory some people were fired already by his wife Agatha. The distributor network that I was taking care of, was send a similar email by AVVT, saying my company is no longer in charge, and they can now all buy directly. Most of them contacted me, to ask what was going on, but all I could say I received an email with the same information. Then something happened, which AVVT had not expected. Some of those people that were fired, including myself, teamed up against AVVT, and this was the beginning of the Emission Labs brand (short: EML). We tried to be as good competition as we could, though we had to start with little business. The first thing we did, distributors had to choose. If they sell AVVT, we won't supply EML to such distributers. The Hong Kong Dealer choose for AVVT, but all the others choose for EML. You have to understand, this was just before the internet, and before Ebay, and AVVT's main communication tool was a fax and post office. I remember how slow a network builds up, without internet. That is because dealers only buy something after they have an order in their pocket, and the big guys had no interest to pre pay an almost bankrupt company for unproduced goods. The same year, AVVT had to close down. Today, EML produces a complete line of High Power Triodes that are unique in quality and life time. Also we have re-made some original tubes as the first company. The 45 that we introduced, was later picked up by the Chinese factories. Added to this are now some limit-breaking tubes, like the 1605 which is the largest single plate triode of it's kind. For my hobbies I have almost no time. That is keeping my Hammond Organs in good condition. I own an original B3 tone wheel organ, born in the same year as myself. It has a mechanical tone generator, and all tubes electronics inside. The B3000 I have, is a 1970's CMOS version of the B3, with the original Leslie Tone cabinets. Unfortunately I don't have the time to play them very much. Here is a sound sample of the B3. From Left to the right: Jean-Hiraga, myself, a technician of Sun Audio and Mr. Uchida, owner of Sun Audio Japan. This was at the morning we left, after three days triode-fun.. I am looking to grow the product range of JAC-Music, offering nice and interesting products, some of which may be hard to get elsewhere. It is just these DIY products that we want to offer simply from stock here in Germany. 1984 Received my Engineering degree at the HTS in Rotterdam. Specialty: Energy, and High Voltage Electronics. 1984 ... 1986. R&D Engineer at Van Berkel's Patent, designing microprocessor hardware, and interfaces. 1985. Finished Post Academic Classes (PATO), University of Eindhoven, Holland, for Grounding and Shielding Methods. 1986 ... 1989. Application Engineer at Hewlett Packard, for Optical Communication Devices. 1987. Finished Post Academic Classes, George Washington University, for Grounding and Bonding and Shielding Methods. 1989 ... 1999. Field Sales Engineer at Hewlett Packard. 1999 ... 2001. Quality Engineer at Agilent Medical division. 2001 ... 2003. Process Engineer at Agilent, for Optical Measurement Systems. 2003 ... Today. Working in my own company. Read here also why I left Hewlett Packard. This is one of the articles I published in the electronics magazines.